Ever wish you could play Hearthstone but with a sci-fi feel instead? Apparently the people at ZiMAD Games felt that way, as they’re behind the recent early access online CCG Star Crusade. I admit that during the first few games, the game could easily be mistaken for an HS clone in space. However, little differences start to add up to create something that at least proved to me the game immediately has a different meta-game thanwhat I’d find in Hearthstone. Oh, and the idea of a 2v2 co-op mode is something we’ll probably not see in HS for awhile, so I figured I’d talk to producer Alex Rechevskiy about where the game is right now and where it’s going. Massively Overpowered: At first, Star Crusade is going to seem like a Hearthstone clone in space. What specific changes or additions do you hope will differentiate SC from HS? Alex Rechevskiy: We have several unique features that will make sure Star Crusade stands out from other games. For instance, our variable deck size customization gives players with shorter decks (closer to the minimum of 25 cards) a chance for an extra card at the beginning of the match, while also allowing them to develop quicker by maximizing their chances of drawing the cards that they need when they need them (this configuration is a favorite for rush and combo decks). Conversely, players with larger decks (closer to the maximum of 40 cards) may be slower to develop, but have stronger defenses — since each player’s starting health (HP) in the game is equal to the number of cards in their deck (25 HP for 25-card decks, 40 HP for 40-card decks and everything in between). Those players also have the luxury of bringing a variety of cards to battle, which will allow them to be prepared for a lot of different situations (which makes this loadout a favorite for mid-range and control decks). Players can also outfit each custom deck with 1 to 3 faction-specific abilities, called “Modules”. Some Modules provide a passive boost or ability, others require activation by the player, and others utilize a secondary resource called “Energy”. Players gain and spend energy during the course of the game, and some cards can be activated in multiple ways, depending on whether or not the player has, or wants to spend, the energy required. 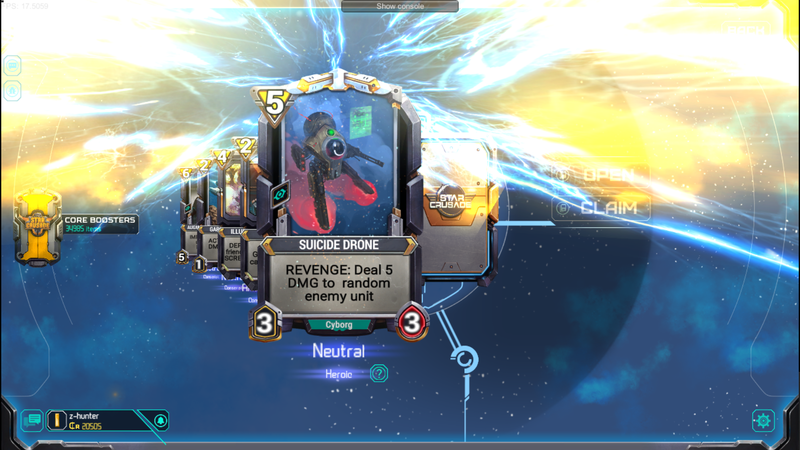 With 400+ cards (and more coming soon), six factions and multiple modules for each faction commander, we are confident that Star Crusade will offer an unprecedented level of deck customization and strategy. SC seems to be launching with more mechanics than HS did, making the game feel a bit more complex. Is this intentional? We’ve always planned to launch Star Crusade to be its own game with its own mechanics. We feel that the features like our variable deck size, Modules, and the secondary Energy resource will be just the start of a unique CCG (collectible card game) that will really come into its own once we come out of beta and start adding even more great stuff. Ah yes, the dreaded Millstone artifact from Magic: The Gathering – I remember getting “decked” in games by players who would make me discard my entire library with that thing! To answer the question, in Star Crusade, we do already have some ways to mess with your opponent’s hand and deck. For instance, the Consortium can place two (weak but somewhat expensive) Mercenaries in your hand that damage you every turn until you deploy them. But deck size is all part of the risk/reward aspect of the game, and part of why I sometimes run 39-card decks – against other defense-minded decks that run the full 40 cards, a 39-card deck lets me have an extra card and develop faster while still having a high defense. As we continue to tweak game balance and add new cards and gameplay modes, we expect that the popularity of low, mid and high-card decks will also shift. Can you share any details about the goals involved in creating 2v2 co-op games, social deck sharing, or in-game events? My brother Dimitri (who is a designer on the game) and I are CCG fanatics and we’ve enjoyed playing CCGs of all kinds for years. We dueled each other and our other M:TG buddies all the time, but also really enjoyed how the game and the strategy completely changed when we started playing larger games with more than two players, such as 2v2 or two-headed giant. Cards that seemed far too costly and strategies that seemed too slow to develop in a duel with 40-60 card decks suddenly became much more powerful and viable in larger co-op games. While 1v1 duels are currently the core of Star Crusade, we can’t wait to see how the meta changes and how people use cards in creative new ways in 2v2 modes. Social sharing will let players compare notes by sharing the entire contents of their decks with other players – we feel this will supercharge calls for feedback and discussions on strategy. And the larger events will provide lots more stuff for players to do – challenging them to step out of their comfort zones with their main decks to experiment with new factions and new play styles – and for much bigger rewards. The map idea for raids is rather interesting. One thing I noticed was that late into the map, there were planets that needed three wins in order to claim them, and it seemed like the prize was a single fleet (I’m guessing this is the name of the «lives» resource?). What’s the reasoning behind having planets like this in a PvP mode that has an entry fee? Raid mode is our draft mode, and as you mentioned, players start with three fleets – each of which represents a single sustainable loss. Three losses will knock you out of a raid! To answer your question about how some planets are tougher to capture than others, this was intended to add an aspect of risk vs. reward. There are going to be easy planets and tougher planets to capture. Tackling a difficult planet puts you at risk of getting knocked out of the raid sooner, but also offers potentially better rewards. It’s all about customizing your experience. We also have a lot of other exciting plans in the pipeline for Raid and other draft modes. Although SC has more built in chat emotes than HS, the game still lacks chat between non-friends. Why not have a chat system? Chat is an interesting subject. We do have plans to integrate full chat into the game, but we want to do it very carefully — Star Crusade was built from the ground up to be a highly competitive game (for those players who enjoy that aspect of CCGs) — and in highly competitive games, the chat environment can sometimes be, shall we say, less than friendly, if not toxic. We’re definitely going to be adding chat features to the game but we’re being very careful about how we implement them. I’ve heard talk of «modules» being added to the game, which allows you to modify your hero power before battle. Can you possibly give us an example or two of how this will work? Yes! We will be adding Modules in the coming days (very soon – they may already be in by the time you read this). These are unique, faction-specific abilities, and each faction will have 7-8 modules available. 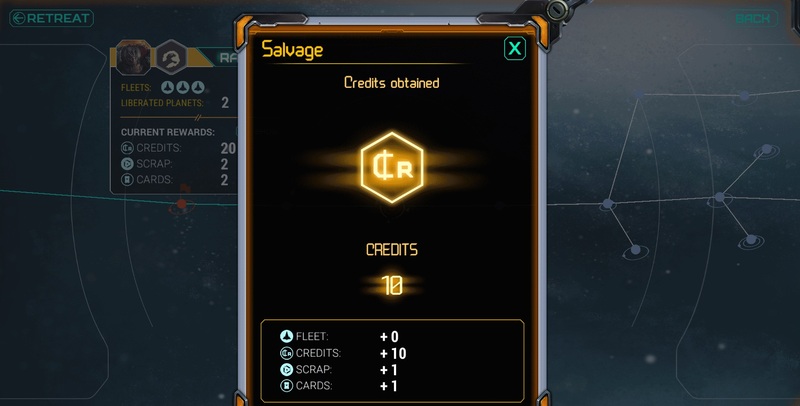 Players can equip 1-3 modules on each deck, which will change your Commander’s abilities and allow you to customize your play style even further. One of my favorites is the Shan’Ti “Viromorphic Spores” module, which let you spread the effects and abilities of one unit to an adjacent unit on its right – you can use this to buff your own forces, to weaken your opponent, or to create many other beneficial situations. One big thing that happens with these kinds of games is that as the game ages and expands, the power gap between new and old players drastically widens. Hearthstone has tried to alleviate this by adding in a new mode that gives a card pack every few days, a daily that does the same, and soon, restricting tournament legal sets. Even then, people often say that online, free to play CCGs become more «pay to win» as you enter the game later and later. Are there any plans on how this may be addressed in the future? Great question. We definitely want to make sure that new players feel welcome in the game and that existing players can keep bringing in their buddies to get started. To help with this, we always have daily missions and bonuses for wins that let players earn free currency to buy packs, and in the future, we’ll be adding longer-term, epic events (that may span multiple days or even weeks) that will let players earn even bigger rewards, free of charge. In addition, one of our upcoming social features will be booster gifting – players who are ahead of the curve will be able to send packs of cards to their newcomer friends. We also pay special attention to balancing our entire card library and making sure that we don’t have outliers on the power curve. This should go a long way in ensuring deck variability in the game meta (which is a good remedy against “pay to win”). Early access sometimes has a bad reputation for being a sort of paid beta companies abuse to seek further funding while excusing themselves from a lack of polish on a game that may be barely updated. What feature or issue really needs to be done right before the game will change to a «released» state? Though the game is technically in Early Access on Steam, it is now officially in a beta state. The reason we’re still running in beta is to get the game in front of as many players as possible and get the community’s feedback and suggestions. Our goal is to balance the game and make it as awesome of an experience as possible. This is why I participate in Twitch streams of the game, why we do developer interviews, and why my brother and I are constantly on the Steam forums, always looking for new feedback to incorporate directly into the game. For now, one of the big differences between the early beta state and our planned launch this spring are the modules. We’re looking to get them up and running soon and very much look forward to hearing what you think. This game is a passion project for us, and one that has been in the making for many years — and we can’t wait to share it with the rest of the world. Please download the beta on Steam and let us know your thoughts! We’d like to thank Alex Rechevskiy for taking the time to speak with us. You can check out the game on Steam right now.